This solution covers how to create a Learnosity-powered blended learning product, driven by our hosted authoring platform for Item & Activity creation. Want to deliver a test or form-based experience — whether that's fixed form or adaptive. Cyberdyne Systems are a large traditional publisher. Founded in 1984, their primary business is the printing of textbooks for the K-12 market. In recent years they have worked on digitizing their vast catalog to create a series of ebooks. Their younger learner (K-6) ebooks have been made available to buy and download in a new system called N-Tykes. Cyberdyne have added basic assessment functionality into these ebooks in the form of 10 auto-scored multiple-choice questions at the end of each chapter. Scores can be viewed online in the N-Tykes system. Have a user-friendly intuitive means of creating complex questions. Make those questions discoverable, and available to be used in multiple product lines. Deliver these questions embedded inside of their ebooks, preferably inline with the content, rather than at the end of each chapter. Improve their reporting capability beyond their current simple report. Figure 1: logical architecture diagram for Cyberdyne's assessment solution. This Learnosity-hosted authoring environment will allow Cyberdyne to author Questions in a user-friendly instinctual manner. Saves all content to Cyberdyne’s Learnosity-hosted Item bank. 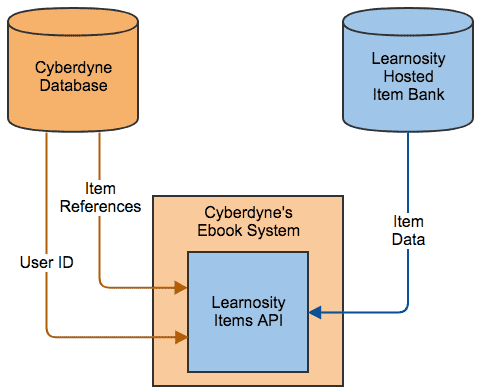 Used to pull Items from Cyberdyne's Learnosity-hosted Item bank and place those at specified locations inside the ebook to create an interactive assessment. Enhance those Items with hints and other helpers. Integrate seamlessly with Cyberdyne's learning material. Be customizable to suit the color-scheme, look and feel of each ebook. Automatically builds a series of standard report types based on the results of Cyberdyne's auto-scored assessments. Embed these reports in the N-Tykes system with just a few lines of code. Display these reports to teachers when they log in. Cyberdyne staff can create Items using 65 different Question types. They can then Tag those Items. Tagging facilitates complex actionable reporting and data analysis. Tagging can also, optionally, allow the Items to be discoverable later to be used in multiple ebooks. All of this Item data is stored in Cyberdyne’s Learnosity-hosted Item bank. Authors will create Items to be embedded inline on an Item-by-Item basis. A placeholder is inserted into their content with a reference to the Item to be inserted at each position in the content. Cyberdyne will then store those Item references in their own database, along with the chapter ID of the chapter they should be loaded into. Figure 3: Item references are stored in the Cyberdyne database. This completes Cyberdyne Systems' authoring process. 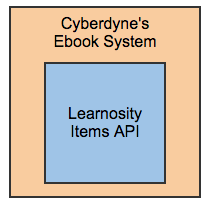 The assessment experience is embedded within Cyberdyne's ebook. This is done using the Items API in 'inline' mode. Each ebook will be associated with a student in the Cyberdyne database. 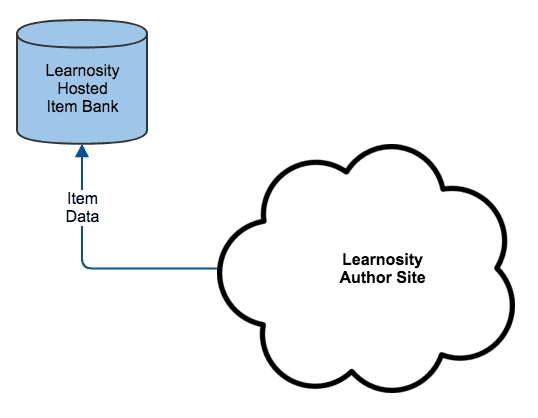 When a chapter is loaded in the ebook, the Learnosity Items API retrieves the Items and inserts them in the appropriate position within the content. The API will take the ID of the relevant Items and the ID of the currently logged in student as two of its parameters. No personally identifying information is used. 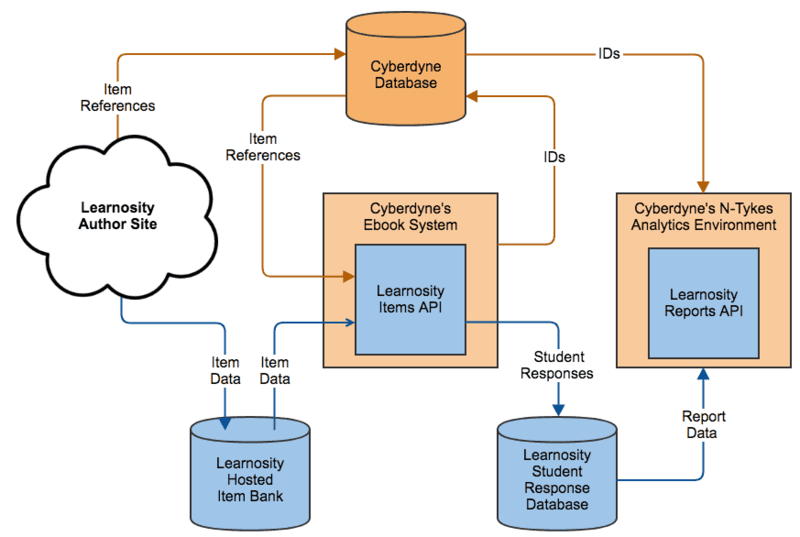 Figure 5: the Cyberdyne database provides the user ID and Item references to Items API. As the student works their way through the chapter, they will encounter interactive assessment Items from Learnosity. The student will complete these Items and at the end of the chapter they will see a submit button to submit their 'Activity'. The student responses are sent to Learnosity for scoring. The only thing Cyberdyne has to do is to be sure to save the knowledge that the user with this user ID has completed the chapter, as well as the session and Activity ID for reporting later. Cyberdyne will use the session ID to identify this particular instance of this user taking the Activity, while they will use the Activity ID as a way of grouping students to create group reports. 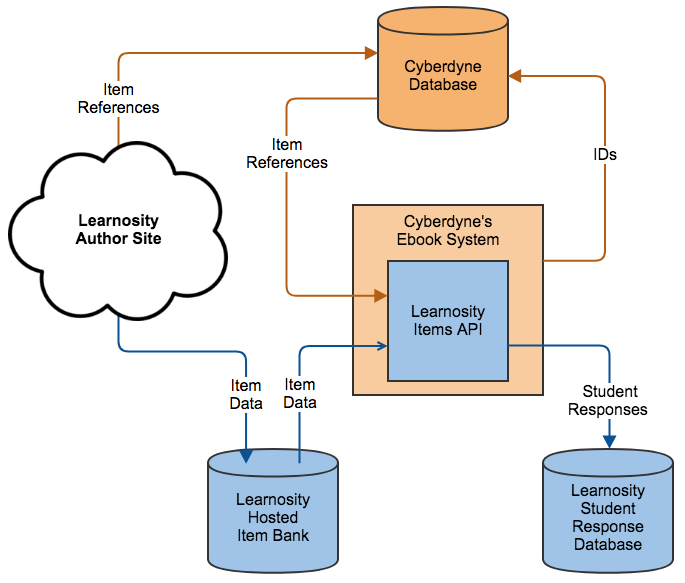 Figure 6: student responses are stored in the Learnosity student response database. Let's recap what has been created so far. 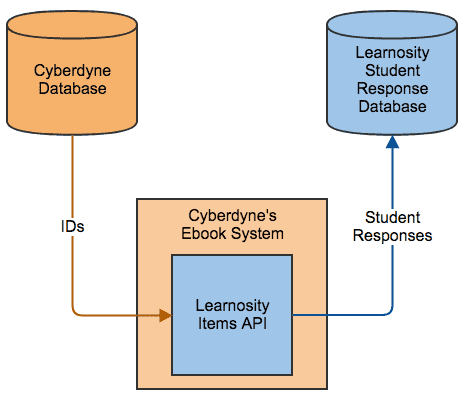 Cyberdyne has used Learnosity's Author Site to create and store all the Items required for their inline interactive ebook assessments. They will store the Item references on their database. Then, when it's time to present those Items as an 'Activity' in a chapter of the ebook, they just need to pass a few relevant IDs from their side along with the Item references for Learnosity to render the assessment experience. Figure 7: Cyberdyne's solution showing authoring and assessment phases. Finally, we will deal with the analytics part. Cyberdyne currently provides a simple report showing the percentage grade for the ten auto-scored multiple-choice questions at the end of their chapters. They would like to enhance this with more advanced reporting with actionable data. This can be done with Learnosity's Reports API which provides a choice of 20 report types which can be nested and linked to create a suitable report structure for the teachers. As before, this will be available online in the N-Tykes system. The IDs which Cyberdyne saved from the last step, during the Assessment experience in the ebook, can now be passed to the Reports API. 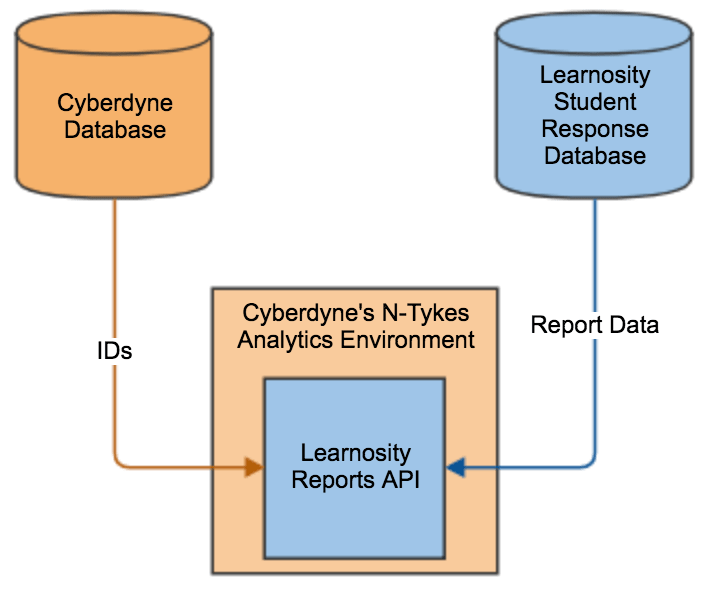 Figure 9: the Cyberdyne database provides user IDs, and the Learnosity student response database provides the report data. The user ID can be used to get reports on individual students, while the session and Activity IDs identify different sets of Activities taken. 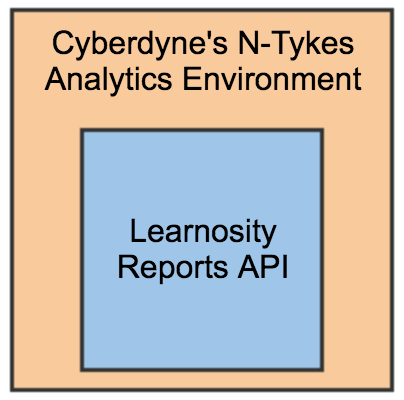 In addition to our 20 basic reports, Cyberdyne may also use some of Learnosity’s more advanced offerings such as Items analysis tools and cohort analytics. Figure 10: logical architecture diagram for Cyberdyne's assessment solution. By using this workflow, Cyberdyne was able to allow their authors to create 65 different Question types, render them as an inline assessment in their ebooks, and get detailed reporting. The only things Cyberdyne had to store and maintain in their database were a selection of references and IDs. Create the Items needed for each of their ebook chapters. As part of signing up with Learnosity, Learnosity'sLearnosity authoring team will provide training. Tag those Items if they choose to avail themselves of more advanced reporting and store the Item references in their database. Add placeholders inline in their ebook content. When the chapter is loaded, initialize the Items API using the required IDs, which includes user ID and Item references from the Cyberdyne database. Add webpages where the teacher can see reports. Select appropriate reports from the 20 pre-built Learnosity examples. Initialize the Reports API with the relevant IDs to generate the required reports.